Some organisation has recently filled my local neighbourhood in the inner London borough of Southwark with a remarkably large number of the above signs. These have been attached to stop signs and other traffic signs, poles holding street lighting, and a few are even attached to poles that hold nothing else and have presumably been installed specially for the occasion. It is hard to imagine government of some kind not being involved, given the public places where they have been erected, but WTF? Are these supposed to make me feel safe? Reassured? Threatened? Creeped out? Vaguely worried? Concerned that money that could otherwise be spent on something useful is being used to pay the salaries of people with far too much time on their hands? Also, WTF? Going to the advertised website is only of limited help. Something about fighting crime with fighter jets? In any event, a badly designed website of the kind one would find from some small company that is desperately short of capital and trying to impress investors after an unsuccessful listing on AIM. Oh, okay, there is something about some kind of partnership in London with the Metropolitan Police elsewhere on the website, but it is virtually impossible for me to link to due to the horrendous overuse of Flash. So taxpayer money probably is involved somewhere. I think I’d go with “creeped out” and “vaguely worried”. And you’re right about that awful website. I can’t figure out what they do (or how they help protect against street crime, which is certainly what the sign suggests.) 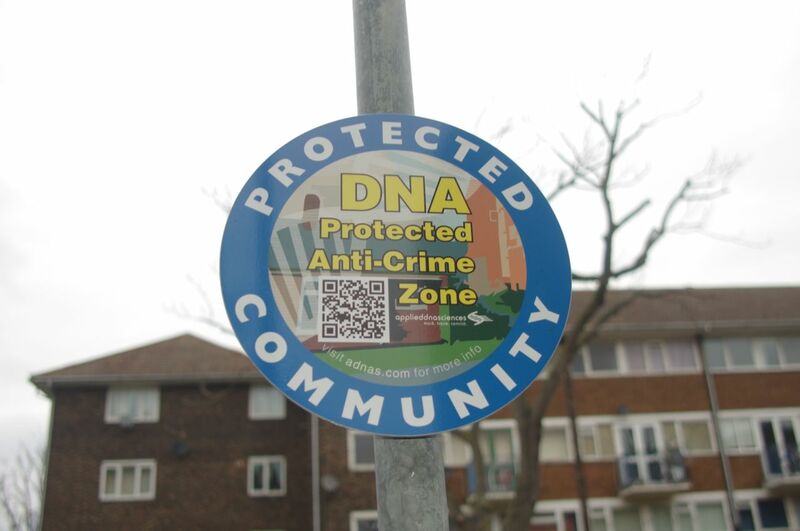 “Applied DNA Sciences delivers counterfeit protection, brand authentication, combats product diversion, and offers its award-winning programs against cash-in-transit crimes, all using the proven forensic power of DNA. With impenetrable taggants, high-resolution DNA authentication, and comprehensive reporting, our botanical DNA-based technologies deliver the greatest levels of security, deterrence and legal recourse strength.” Is there any information content in that paragraph? I suspect that in this case, DNA = Tono-Bungay. Seems like some kind of Banksy type prank. Is it something to do with horsemeat? DNA- isn’t that the National Dyslexics Association? It’s like tagging things with microdots but using a synthetic DNA to mark property instead. Nick wins this one. Best laugh I’ve had all afternoon. Looks like some kind of taggant. Really doesn’t matter what exactly the mechanism is, there are certain characteristics that are required for a good taggant. Looks like they are just expanding into new markets. The neighborhood marking is pretty creepy. Just what is being marked? Can it be used to trace people? Will it be used that way? If it can, it will. WTF indeed. At first I thought this was something to do with the curious obsession of certain councillors to DNA test all dogs, so as to be able to trace the dogshit on pavements. The control fantasies of these sad little men never cease to amaze and disturb in equal measure.